My beautiful wife bought this book from a Facebook friend because a portion of the proceeds went to help people recover from the Tennessee wild fires last year. She might have given it to me, or I might have taken it from her in a fit of kleptomania. Regardless, I started working through it during the football season as I often do such volumes of poetry, and I recently picked it back up from the stack of books beside the sofa where some of the books have been sitting for several football seasons awaiting my perusal. It’s like the Rooneyfication of reading materials over there. 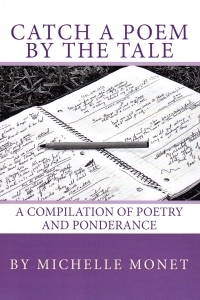 At any rate, the poet is a three letter woman with this volume of poetry: She is a former professional singer and has appeared on stage on multiple continents; she followed that up with a visual arts (drawing and, one assumes, sculpture) period that included traveling to arts fairs (revealed in the book). Then she decided to take up poetry, and the result is this book. It’s not a bad book, but it is a bit of a doodle book of poetry. The author includes a number of poems that are just noodling with words and poetry. Much of the work lacks a refining touch. There are some turns of phrase here and there that are pretty good, but mostly it’s just self-expression. Hey, I’m not knocking it. I’m finta do my own collection of poetry one of these days. The meaning of poetry comes from what effect it has on you, the individual. This particular collection didn’t resonate with me, but I’m more of a classicist when it comes to poetry. Your mileage may vary. So we’re at the Springfield Art Museum in the very back, amid the American Art, when the children spot an iPad mounted on the wall, and being deprived mostly of electronic devices at home, they zero right in on it and hope for a couple minutes (or hours) of gaming. Except, of course, they have. “You listen to heavy metal all day and jazz all night,” the oldest said. Clearly, he does not understand that this photo shoot does not require a model, and I couldn’t use him anyway, since he didn’t sign a release. Or perhaps he’s commenting on the photo’s composition. This book is a short discourse on the development of weapons from the middle of the first millennium to the middle of the second, but the focus is definitely on the period from roughly 1000-1500 AD. It says “Knight,” after all. The chapters are broken down into weapon groupings: Spear and Lance; Axe, Mace, and Hammer; Sword and Dagger; and Early Firearms. 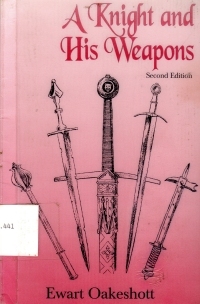 The individual chapters are told in a bit of rambling discourse style, as though the author were speaking off-the-cuff, although there are a number of black-and-white illustrations included to show the weapon innovations as he talks about them. Unfortunately, these illustrations are a bit crude and might have made the text clearer if they were not. At any rate, it was an hour or two through, as it only is a shade over 100 pages plus glossary and index. I learned one thing, for sure: I need a glaive in my personal collection. Also, even though Ewart Oakeshott sounds like the name someone would choose in the Society for Creative Anachronism, he was a weapons collector and illustrator who definitely knew his material. It’s just that the presentation in this novel could have used some improvement with some charts and timelines and some better organization. But if all you’ve seen is the illustration in the first edition of Advanced Dungeons and Dragons, you could learn something. And by “you could,” I mean, “I did.” Although none of this material came up in the Geek Trivia Night I attended this weekend, unfortunately. You know, add the Fine Young Cannibals, and you’ve got a tour right there. I pronounced it “chay-ose,” for sure. And to be honest, I probably still say bed-raggled. I’ve learned so much of my vocabulary from reading that I have an accent all my own. I know rabid comes from rabies, so why isn’t it “ray-bid”? It is in my world. The same for vapid which comes from vapor. And I am sure I have been forgiven for saying sub-see-quently to my in-laws (because it has the same root as sequence. And don’t get me started on the morning food called the bag-el (or perhaps that is what Superman was packed in when he was shipped to Earth). I can get away with it in a lot of cases because I use a lot of words that many people don’t know (or at least they don’t know them like I say them). However, my mother-in-law is a former English teacher, so she and her beautiful daughter correct me gently as though English is my second language. Hah! It can’t be. I don’t even have a first language yet. I’m listening to a Great Courses lecture series on ancient civilizations (now that I finished the series on Chinese history). We’re on the subject of Sumerian civilization, and the professor keeps mentioning Uruk and Gilgamesh, and I’ve got the epic of Gilgamesh around here somewhere. I think it’s to the left in my office…. Hmmm, I don’t see it. Maybe I moved it in the shuffle when I cleaned and turned over my library last summer. Hey, here’s a book by Yogi Berra. I’ll read that. So you’ll soon see a book report on that book instead of something smart like the Epic of Gilgamesh. On the other hand, there are more people who know who Yogi Berra is than Gilgamesh. But probably not anyone under thirty. 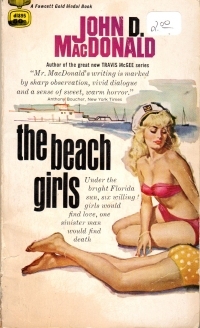 This book is definitely a MacDonald: It features a bunch of people in a marina on the east coast of Florida in the 1950s. You’ve got a businessman from up north coming down, looking for the man who seduced his wife and caused her suicide. You’ve got a number of individual characters living on the boats and/or chartering fish boats. You’ve got big businessmen putting the squeeze on the small marina owner, trying to get her property for development. And you’ve got a climactic party on the dock. That said, it’s not a particular stand out volume in his work. It has his trademark outstanding writing and whatnot, but the elements of the plot and the characters fall into what would later become MacDonald stock. Ef yew keep yo haid when all about yew air a-losin’ they-yurs an a-blaimin’ it on yew? Mostly because I just read The Grapes of Wrath (donchewno? ), and it’s all a-rife with the vernacular (albeit a different accented vernacular). Also, I’ve read my Kipling, and that’s something MacDonald and I can share. I’ve gone on about this at length, I know, but it makes me thing the middle twentieth century was a time when an author assumed the reader had read Great Books with him. But I digress. So I got that out of it. The older I get, the more I get out of reading these books and understanding more allusions (see also A Tan and Sandy Silence and Two Other Great Mysteries). Of course, I said the same thing to Robert B. Parker almost thirty years ago. Read it if you’re a John D. MacDonald aficionado. If you’re not, start out with some of his other works and then read it, for you will by then have become a serious John D. MacDonald aficionado. It took me two tries to read this book; I started it last year and got about halfway through it, enjoying it for what it was before taking it out of my pocket as my carry book and planning to read the last half of it all at once. That didn’t happen, so I started it again this year as my carry book and keeping it in pocket until I finished it. 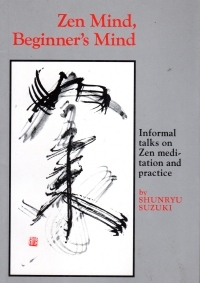 The book is a collection of informal talks given by the author after sitting with students practicing zazen. The author founded the first Zen temple in the United States, and this book collects some of his insights into Zen. The cosmological/theological/heavy philosophy (the eternal, the afterlife, interpretation of the texts). Practical philosophy (the guidance to everyday living). The practice (the things to do when you’re a part of the religion). Although this book does lightly touch upon the first (that the individual is akin to a droplet of a stream in a waterfall–part of the stream, then alone briefly, and then part of the stream; that breaking out of the cycle of karma is the goal of Zen, as karma is a self-centered way of thinking), it focuses mostly on the last two, which is fitting: the talks were give after the practicing with an eye toward improving that. Basically, it’s to sit still, in the proper posture, breathe right, and clear your mind. Okay, there’s a bit more to it than that, such as dealing with distractions within and without, but that’s it. Strangely enough, although they’re from different schools, this book and Start Here Now don’t differ much on the practice of Buddhist meditation. Perhaps the difference between Shambhala and Zen schools lie at the higher levels of philosophy. I was most interested in the middle point above; Practical philosophy. Buddhism focuses on recognizing the transience of this life and all of its moods, emotions, and events. Buddhism is much akin to Stoicism, so much that I checked to see if the sutras might have made their way back to Rome before Zeno (the other Zeno) founded the Stoic school. It was only about a hundred years, but I wouldn’t be surprised to learn that the sutras might have made their ways west before the later thinkers made their marks. Both philosophies urge that calmness and detachment which, if you know me, you probably can tell I appreciate. The Buddhists also talk about nothingness, but when they do not mean it like the Existentialists do. In the Buddhist sense, “nothing” is the eternal something from which everything is drawn. In the Existentialist sense, “nothing” is the opposite of that. The book is written in the proper Buddhist style, wherein the koanesque nature might make you go “Huh?” The question of the sound of one hand clapping appears. Once you get it into your head that the Buddhist way is to see the gestalt and the particular at the same time, you can understand it better (the forest is the trees; the tree is the forest). Some of them do go into paradox territory, but as with any religion, eventually you have to make your peace and accept some paradox. So I enjoyed the book and got some insights into detachment (and a couple of posts quoting the book–search for the wisdom of shunryu suzuki). But it’s a practical and practice primer on Buddhism, akin to the Max Lucado Christian books: A bit of how to live as a Buddhist, but without the implications and intimations of the religion that you get from the heavier books by Kierkegaard, Niebuhr, Tillich, and so on. If you believe Alex G. Smith, that’s how the Buddhists hook you, with their practical philosophy and practice, but that’s how the Christians hook you, too (Tolstoy’s favored religion features that sort of peasant, practical religion, and that explains why he equates religions based on this practical philosophy level. Now, where was I before I started name-dropping other things I’ve read? Oh, yes: The book is a good primer into Zen Buddhist thought, especially the practical philsophy and practice components, and you could learn something from it. But don’t read it and declare yourself a Buddhist, as it really lacks a cosmological component that explains it all. Of course, the Zen would argue that you don’t need to know it, just to do Zen. But I’m a Western kid, and I expect a bit more in a complete belief system. Which is why I’ll never be a Buddhist. It occurs to me that two of the books I’ve read so far this year, The Grapes of Wrath and On the Road, center on road trips to California. To recap: In The Grapes of Wrath, the Dust Bowl Effect, crop failures, and unpaid bank loans drive the Joad family from their small farm in Oklahoma and onto California, which has been promised to be a place of plenty and work for everyone but that proves to be something else. It’s rife with Hoovervilles, people who mistreat the Okies, and capitalism exploiting the little guy. In On The Road, a veteran travels repeatedly to California by various means and goes to San Francisco to listen to jazz music, mostly. The two books appear only 18 years apart, though, but they seem to come from entirely different ages. The Grapes of Wrath seems to have been set in a past era, like the 19th century, whereas On the Road is a slightly less modern but still modern era book. What happened in the interim? The Chinese revolution and forced redistribution of land. World War II would seem to be the facile answer; after all, the protagonist of On the Road was a veteran of World War II, and World War II changed everything, right? No, rather: In the 1940s, we see the electrification of the United States and how it catches up to the urban areas. As Growing Up In The Bend reminds us, rural parts of Missouri did not get electricity until the 1940s and 1950s, and many farmers were still using draft animals on their small farms within living memory even while the cities were running street cars and televisions. So the divide between the books is more a matter of city versus country than anything else. By the time The Grapes of Wrath hit the streets, the pulps and the presses already had detective fiction a la The Maltese Falcon (1939, film in 1941) and The Big Sleep (also 1939, with the Bogart film in 1946, seven years after The Grapes of Wrath). These books have a more modern sensibility to them because they deal with urban centers in California. 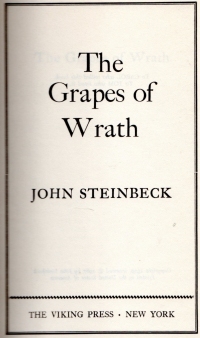 The Grapes of Wrath, on the other hand, deals more with the rural areas of the country at the time. By the time On The Road rolls around, the rural areas are mostly electrified and have more of the conveniences we associate with modernity. Funny: John Steinbeck’s heroes of the rural world elected Donald Trump. Do you suppose they’d be the heroes of The Grapes of Wrath 2017? It’s a self-published bit by an author with a large number of books available, so I expected something akin to a men’s adventure paperback like the Executioner series or something you’d find on Glorious Trash but with a more modern bent. The book details how Lily becomes involved with a stone killer hiding out from his past. But he’s just like seventeen or eighteen and is a super soldier. When he defends the video store where they work together from a robber with extreme prejudice, people from his past, including some other super elite soldier types (with gimmicks) come looking for him. And his brother, perhaps even a better killer, breaks out of his special prison and goes looking for a special MacGuffin which Lily and Sid (the super soldier) must find first. So the book has its postmodern bent, where Lily calls the MacGuffin the MacGuffin. It doesn’t take itself too seriously, and it has its tongue in cheek. But, boy Howdy, is it lurid. Lily is promiscuous, and she has numerous encounters with Sid and others. They’re not Gunsmith-level depictions of human intimacy, but they’re not couched in the-train-whistle-blows-and-the-train-goes-into-the-tunnel-symbolism, either. The fighting sequences take the worst splatter-instincts of the Gold Eagle or Death Merchant metal-and-anatomy prose Pollock portraiture and amp it up. Which might be part of the post-modern winking of the book. Which is not to say it’s poorly written–the story and text pulled me along in spite of the purple. But it’s probably not for everyone, and I’m not entirely sure it’s for me. Which might be unfortunate, since I bought a second book by the author (not in this series). Both at full price. I enjoyed it better than The Grapes of Wrath. Also, I phrased it that way to better serve as a blurb should the author search for himself and find this review. “Better than The Grapes of Wrath”–Brian J. Noggle, author of John Donnelly’s Gold. Because I’m working on marketing myself and my Internet brand even as I jot down thoughts on things I read. What was my point? Oh, yeah. Recommended? Well, perhaps, if you want to experience what it is like in the 21st century to read something comparably trashy to men’s adventure fiction was in the 1960s. 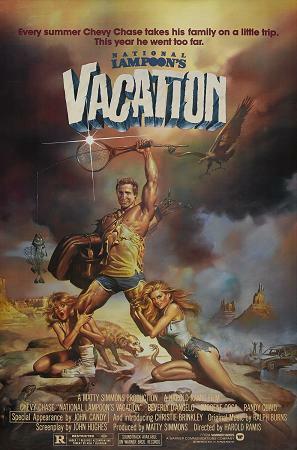 So upon further reflection upon the book The Grapes of Wrath, I realized that I liked it better when it was retold as National Lampoon’s Vacation. What? You’re a skeptic? Listen, they’re the same exact story just in different eras and with a slightly different focus. Joseph Campbell’s monomyth cannot account for all the similarities. Encouraging strangers invite reflection Casy, the former preacher Christie Brinkley, the woman in the red Ferrari. You see? The same story! Trust me, I have an English degree which uniquely qualifies me to find such obvious parallels and to write about them at great length. I told my beautiful wife that I had previously read this book in high school because I am a compulsive liar. I actually read it, now that I think about it, probably in my modern American literature class at the university instead. I remembered the basics of the plot, but that’s about it. Otherwise, I surely would not have read it again. Make no mistake: I like Steinbeck well enough (see my reports for Travels with Charley, The Long Valley, Tortilla Flat, and Of Mice and Men). But this book, Steinbeck’s magnus opus, is nothing but Depression era full-on socialist/communist agitprop and not a very good story. As you might know, the plot revolves around the Joad family. Small farmers in Oklahoma, a number of bad years and overdue bank loans force the family off of their land when their home is foreclosed upon (and “accidentally” damaged by the tractor driven by an operative of the new land owner, who turns it into a portion of a larger farm. They buy an old, beaten down truck and begin a journey to California based on a handbill that they have seen promising work picking crops there. They go on the road, have some adventures incidents, and eventually reach California to find that the handbills have drawn hundreds of thousands of people in similar circumstances, and there’s not enough work to go around. So the Joads live in a Hooverville, get driven out, live in a government commune for a while, but leave to look for work up north. They find some work picking peaches, but Tom kills another man and has to go into hiding, so they go to a cotton picking operation some miles away while Tom hangs out, and when his younger sister blabs, Tom goes on the lam. Then a flood forces the remaining Joads out, and life goes on. Well, some other stuff happens, but that’s the nub of it. Thematically, it’s all about Capitalism Bad, Substinence Farming Good, and Government Socialist Communes Good, Too. The narrative story of the Joads is broken up by short chapters decrying some bit of capitalism or another. We get bits about the banks, bits about car salesmen, and how capitalism is destroying the country and keeping the little man down. The characters themselves are not very deep; instead, they’re ciphers of good, simple farmers buffetted by the bad winds of change. The main hero, for Pete’s sake, is a hothead who is just getting out of jail for second degree murder, and he commits a second one by the book’s end. The younger brother is ruled by his hormones. The father and uncle are unimaginative. The mother, who holds it all together by being strong, is simple. I get the sense that Steinbeck doesn’t like his characters so much as pity them (an insight I can apply to his other works, too), and that makes for characters readers cannot relate to. The Joads are isolated, too; although they’re said to be Godly folks (especially the grandmother, who spurts out “Praise Gawd” like she’s got a Christian flavor of Tourette’s Syndrome), there’s no church, larger family, or support system when they fall on hard times. It’s a lot like when Barbara Eihenreich pretended to be poor for a book (Nickeled and Dimed: On Not Getting By In America). The poor cannot get along without government help because extended family, charity, and churches don’t exist. So I didn’t like the book, and I wonder if it’s on so many syllabi simply because of its anti-capitalist content. It’s not even Steinbeck’s best (The Winter of Our Discontent is far better). Reading this compassionate reflection of migrant peoples deserving their small plot of land for substinence farming, I’ve got to wonder what Steinbeck would make of current migrations, such as Mexican residents coming through those same areas of California today (and with the same economic goal/impact and resistance from existing residents of the area) and Middle Eastern refugees coming to Europe. Would Steinbeck be as sympathetic to these migrations and so disunderstanding of existing residents who might resist the new people arriving? Steinbeck shows no sympathy to Californians already in California when the Joads and other displaced people arrive. The book also romanticises a family’s tie to a small patch of land, like five acres with a small cash crop, some dooryard crops for eating, a couple of chickens, and a couple of pigs. If only everyone could have that instead of large tracts owned by large-scale food producers using tractors! However, the economies of scale in large farms and livestock operations provide the food needed by large populations, especially urban populations, of the twentieth and twenty-first centuries. A lot of people don’t get that, and insist that hobby farms can provide everyone with what they need. This book certainly wants us to think that, but sustenance farming was mostly sustenance farming, and a couple of bad years could wipe a family out. As they did in the beginning of the book, but Steinbeck does not see a lesson in that. That’s not to say I didn’t take something from the book: Since I’ve read it, my diction has declined a bit as I’ve started imitating Steinbeck’s representation of sloppy Okie speech, and I’ve started eating beans as whole meals. It did help me along with one of my current goals for 2017, though: I’m hoping to finish reading all the comic books I own, and as I crept along through this book at two chapters a night, I filled the rest of the reading time with comic books. I’m almost ready to start the box of comics I bought at a garage sale nine years ago. So I’m on track for that goal. At any rate, I’m happy to be done with this book. This old advert from the back of a comic book looks like a quiz to me. On the plus side, I own more than one of each. So if there’s some weighting to this quiz, I’ll still pass. 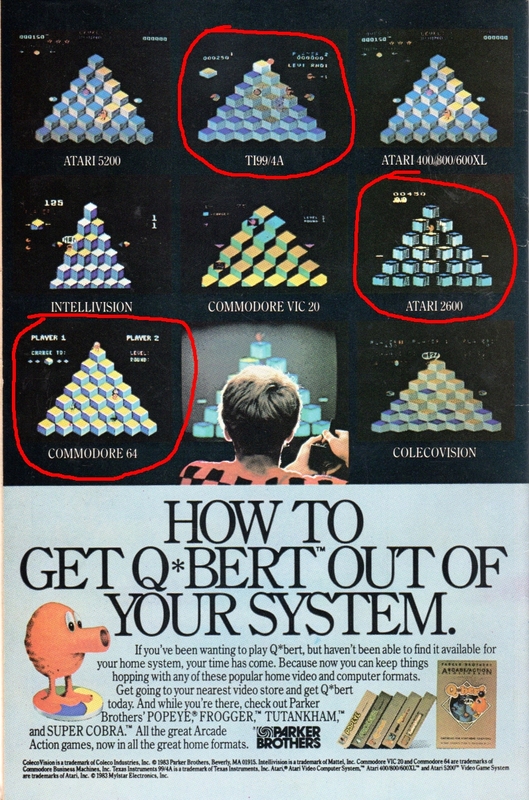 As to how many of the systems do I have Q*bert on, that’s at least one and probably two or three. Maybe even for, since I have a Colecovision cartridge or two even though I have never owned a Colecovision. I’d say “I’ve got to collect them all,” but I’ve watched for old systems at garage sales and estate sales when I get to them, but you don’t tend to find many in the wild any more. And I’m not likely to buy them from stores or online sites since that’s not the fun of collecting. The fun of collecting is in the hunting and finding (but, no, honey, I’m not going to practice catch and release with any of my acquisitive hobbies). Of course, this is a bit of obscure humor. One must be a northern person of a certain age to get it. Cannibal sandwiches are open-faced sandwiches of raw ground beef served on rye and topped with raw onion. Or, if you cannot afford onion, onion and/or garlic powder or salt. My sainted mother was not an ethnic Pole or German, but she served us this treat on occasion. I think it’s because she didn’t like to cook. It’s been decades, of course, since I’ve had a cannibal sandwich since everything is more dangerous these days, or at least the risk of everything is hammered so loudly that its outsized peal keeps us from so many things. As to cannibal sandwiches, the media continues to extol its risk even into the 21st century. But it won’t be running these stories for much longer, as people who enjoyed the dish in spite of its risk die out. Not from the deadly food, but from old age, which kills a lot of the risk-ignorant and all the risk-averse. Oh, and by “overcooking the cannibal sandwiches,” I meant “made hamburgers.” But that was before I took a little slice of humor and tried to blow it up into a Greater Meaning as one is wont to do one one’s eponymous Web log. Captain Olympic’s Sidekick, Brian J. 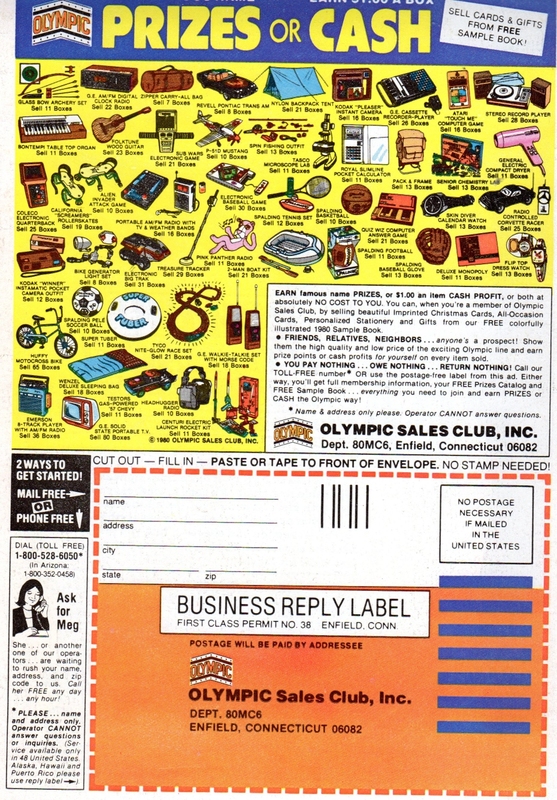 Back in the olden days, and by “olden days,” I mean the 1970s and 1980s, comic books were rife with offers for enterprising youths who could order away for catalogs that held various items (seeds, greeting cards, and so on). You could then go and hit up your family or neighbors for sales, and you could get a cut of the sales price in cash or you could get stuff. Not depicted: Captain Olympic, the superhero they would later feature in their ads. We started with the program a year or so after this particular ad from 1980. We were still living in the projects in Milwaukee, and the prizes were a wonderland of things we couldn’t get except at Christmas or our birthday, maybe. With a little hard work and the sufferance of our neighbors and relatives, we could earn them. A Kodak Winner 110 camera (which you can see in the advertisement above). That little camera documented a lot of my life from the early and middle 1980s (although on Facebook I have a large number of images posted, the only mention I have of it on this here blog is the time I won a photography award in middle school using a snapshot from it. The microscope set from the picture above. At the time, I was a well-rounded little smarty pants, and it wasn’t clear whether my smarty pantsness would lead me to science or to the arts. We used it for years, my brother and I, looking at the little slides they sent with it and looking at leaves and stuff. Remembering those days, I got a microscope for my boys for Christmas the year before last, and I don’t think they used it as intended before destroying it. But it does make an effective artillery piece for action figure battles, or so I’ve been told. A small notepad/organizer thing that I took to my grandparents’ house alone one night, when my grandfather and I talked geneology. I don’t know if it was for a school project, but it was a rare thing for me to spend some one-on-one time with him, and I felt like such an adult at about ten. 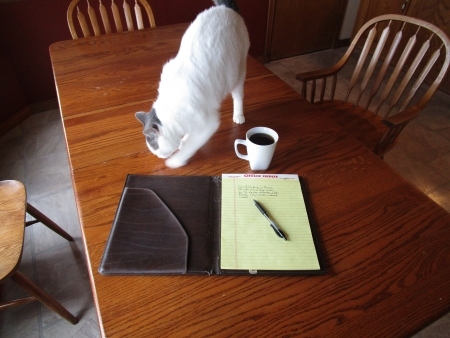 I took copious notes in that little notebook, and I lost it not soon thereafter. I seem to have a tendency to lose meaningful notebooks. That’s another story, perhaps a Personal Relics entry to come. Our first copy of the basic Dungeons and Dragons set. We got this when we lived in the trailer park, and we spent many afternoons and weekends playing, my brother, the two Jims, and I. I’ve played with many gaming groups in the years between then and early marriage, but it all got started with that set. A Polaroid instant camera that I got about the same time (“A Picture Holds 1000 Memories” talks about a picture I took with it). I don’t know why I thought I needed a second camera. Perhaps impatience with developing the film. The film was more expensive, though, so it got used on more consequential things, like pictures of our Pekingese doing smart things. Some pack rat I am; of the items we got from Olympic, I’ve only got the D&D set left. But lots of pictures from the cameras, so they were definitely worth it. Of course, kids don’t have these sorts of opportunities now. I know in my own life, when I hit middle school or high school, suddenly all my selling went from Olympic greeting cards to school fund raisers of various stripes. Did schools just start with the using children as fundraising tools at that time, or did I just age into it and/or move to a place where it was more common? I don’t know; however, I do know that kids today never hit me up for their own good, but instead from a very early age try to sell me things for their various programs and school functions. I suppose there’s a free enterprise versus ward/tool of the State essay in it were I so inclined. But not today. You see? I was not making it up! The image is that of a young lady, but it’s probably not directed at the ladies, you know (although there is such a thing as too thin for a woman, and if you look at fashion and health magazines, you’ll see it). Instead, it’s directed towards people like me circa 1980. Rest assured, me in 1980, you’ll gain those inches and pounds once you reach middle age. I haven’t picked up a recent comic, but if they had any advertising in them these days, I would expect them to have the opposite sort of come-ons. As much because the kids are a little heavier these days, but the average comic book reader these days has probably also reached that place where the pounds and inches come easily. We’re not too far off from television advertisements where the announcer says “See our ad in The Incontrovertible X-Men!